An Artist's Impression of 8rium. 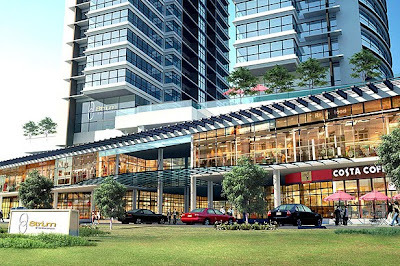 KUALA LUMPUR: Land & General Bhd (L&G) expects its latest project, 8trium, a mixed commercial development in Bandar Sri Damansara, to break even by year-end. Managing director Low Gay Teck said currently, about 90% of the company’s unbilled sales were from 8trium and he believed the development could be about 90% sold by the middle of next year. 8trium comprises a two-storey 100,000 sq ft retail podium and 260 office suites in two business suite towers. L&G will maintain the retail podium once it completed. “Thirty per cent of the units in Tower 1 that was launched recently have been snapped up and about 90% of the units in Tower 2 have been sold. “The response to 8trium illustrates that we have successfully introduced the right product that suits our buyers’ needs,” he said yesterday at the 8trium groundbreaking ceremony and customer appreciation event. Low said currently, L&G had about 45 acres of undeveloped land in Bandar Sri Damansara where it planned to develop residential and condominium projects once the proposal had been approved by the relevant authorities. “We plan to acquire more land in the Klang Valley to develop mixed projects (commercial and residential) and these will be financed by the company’s internal funds and bank loans,” he said. Property developer Land & General Bhd (L&G) expects 90 per cent of units in its two commercial towers in Bandar Sri Damansara, Selangor, to be snapped up by June next year. Dubbed "8trium", the commercial development comprises a two-storey 100,000 sq ft retail podium and 260 units of office suites contained in two blocks. The development has a gross development value of RM160 million and makes up 90 per cent of L&G's unbilled sales. "Tower 2, which was officially launched this July, is over 90 per cent sold. Meanwhile, 30 per cent of Tower 1, which was launched 10 days ago, has been taken up," L&G managing director Low Gay Teck told reporters after the 8trium groundbreaking ceremony yesterday. The project is slated for completion by the first quarter of 2012. The developer is also looking to develop another 16.18ha in Bandar Sri Damansara. "We have submitted the necessary documents for the approval of the relevant authorities for a residential development there," said Low. L&G is also in talks with landowners to pursue land deals in the Klang Valley, for either residential or commercial developments. "We don't have a target landbank size, but what we look for is valuable land. Our business direction is to consider areas that are sought after," he said. The land purchase will be financed via bank borrowings and cash reserve. 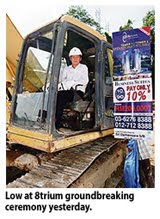 L&G also has undeveloped land in Sungai Petani and Johor. KUALA LUMPUR: Atis Corporation Bhd is raising its stake in property developer Mutiara Goodyear Development Bhd to 30.28% with the proposed acquisition of an additional 9.26% at 97 sen per share for a total of RM20.74 million cash, in a related-party transaction. Atis said yesterday it had entered into an agreement with Laman Arif Sdn Bhd and Lim Beng Guan to acquire their 9.26% stake comprising 21.38 million shares in Mutiara. “The proposed acquisition is in tandem with our corporate vision, as we view the investment in Mutiara as strategic to our core business. “Atis would be able to synergise the business of both companies, and enable us to tap into Mutiara’s business presence, network and expertise to derive business opportunities of providing electrical and engineering products required by future development projects,” said Atis. Lim is a non-independent non-executive director and shareholder of Atis. The transaction is deemend a related-party transaction as Lim is also the executive director of Mutiara and a major shareholder by virtue of his direct interest in the company and indirect interest via Laman Ariff. Prior to the disposal, Lim owns 6.28 million Mutiara shares or 2.72% and Laman Arif 15.1 million shares or 6.54%. Cumulatively, the two vendors’ total cost of investment in the 21.38 million Mutiara shares from October 2007 to October 2008 was about RM21.27 million or 99.46 sen per Mutiara share. Mutiara yesterday closed two sen lower at 83 sen, with 263,000 shares done. Recently, Atis proposed to acquire an 8.66% stake comprising 20 million shares in Mutiara from WEIDA (M) BHD, also at 97 sen per share for a total of RM19.4 million, bringing its stake in the property developer to 21.02%. Weida, which holds a 17% stake or 39.09 million shares in Mutiara, had then said it would also seek a general mandate from its shareholders to sell its remaining holding of 19.09 million Mutiara shares (8.27% stake), either via the open market or placements for no lower than 97 sen per share. The latest acquisition would push up Atis’ net asset per share to RM1.60 from RM1.45, and increase its net borrowings to RM74.65 million from RM34.5 million, while its net gearing ratio would rise to 0.29 times from 0.15 times based on its consolidated results as of March 31, 2009. Mutiara Group develops residential and commercial properties in Klang Valley and Penang and has strategic landbank in these two areas. HUNZA Properties Bhd plans to raise at least RM43 million from a rights issue to finance ongoing projects, investments or fund working capital. The property developer has proposed to issue up to 45.21 million new shares on the basis of one new share for every 10 existing shares, it said in a statement to Bursa Malaysia. It has also offered one free warrant, with a maturity of five years, for every one rights share. It has yet to fix the issue price but it will not be lower than RM1. MALAYSIAN companies have been invited to capitalise on investment opportunities in Zambia's construction industry worth a potential US$1.77 billion. Zambia's National Council for Construction executive director Dr Sylvester Mashamba said the African country welcomed all businessmen from Malaysia to invest in the industry, either by themselves or in joint ventures with local companies or government agencies. "We have a lot of things to offer to Malaysian businessmen, especially those in road construction, through government funds worth US$1.6 billion for the period from 2004 to 2013," he said at a half-day seminar on "Business Opportunities in Construction and Education in Zambia" in Kuala Lumpur today. In addition to roads, Mashamba said, other areas that Malaysian companies could participate included sports infrastructure, water and sewage disposal infrastructure, multi-facility economic zones in Lusaka and Chambeshi, housing and hydroelectric power stations. The construction sector has been the biggest growth industry in Zambia in the past 10 years with its annual growth rate averaging 17 per cent, he said. Bilateral trade between Malaysia and Zambia in 2008 totalled US$17.5 million with exports valued at US$4.7 million and imports at US$12.8 million.